Nielsen recently released their 2016 U.S. Music Mid-Year Report. Audio streaming is now the leading format (over video) with 54% of all streaming. Including music videos, Americans streamed 209 billion songs from January through June. Other market segments, such as CDs and digital albums, declined by 12% and 18% respectively. 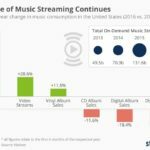 Digital track sales fell a whopping 24%, with vinyl sales seeing a significant increase in popularity. Audio streaming is made possible through broadband alone, and many, if not most, Americans depend on it for entertainment and basic necessity.